POSTAGE DUES / NACHPORTOMARKEN: MADAGASCAR UPU ARCHIVE RECEIVING AUTHORITY SPECIMENS: 1924-26 Kinder mit Wertschild 15 & 40 (SBK 44 & 48 / Mi 44 & 48). Three examples of each affixed to portion of ledger page and handstamped with circular "POSTES ET TELEGRAPHES / COLLECTION / DE BERNE / MADAGASCAR" in red. 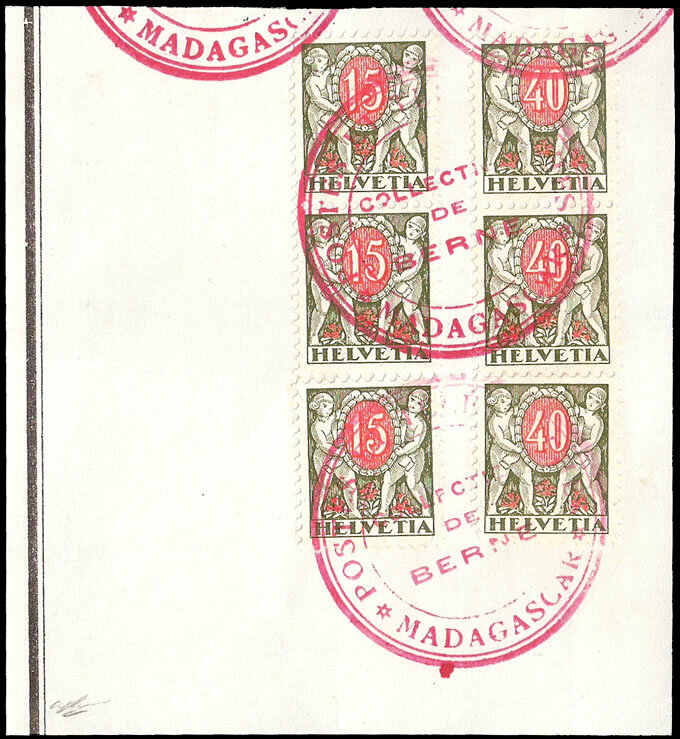 A rare group sent from the UPU in Berne to the Madagascar Post Office where they were affixed to the ledger page and tied by the Madagascar handstamp. VF, rare, an attractive and interesting presentation of these stamps.